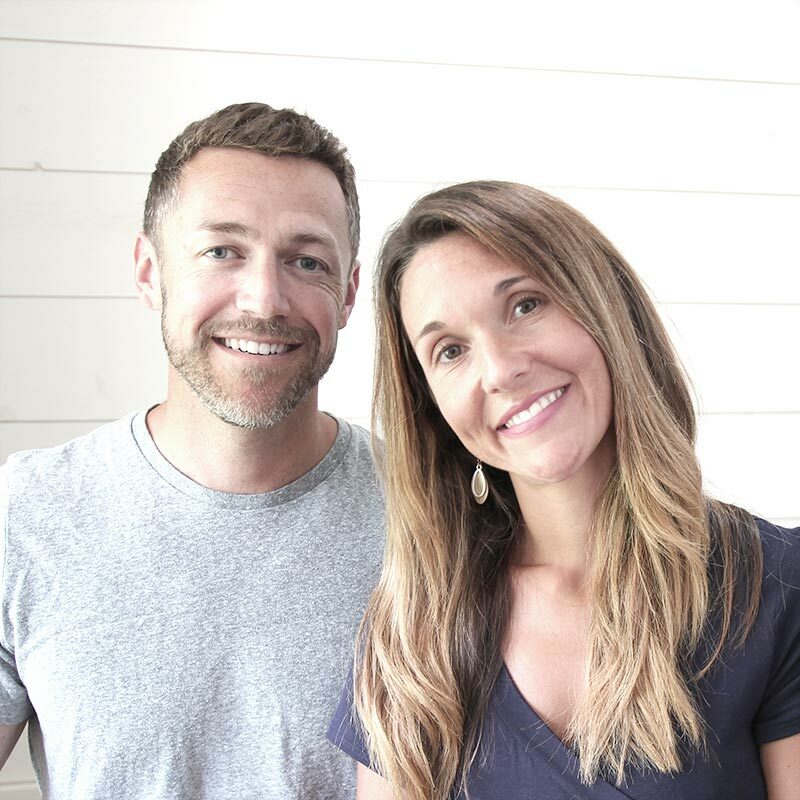 A few weeks ago, we posted our first home tour article, giving you a look around the exterior of our house. Now it’s time to head inside and start showing you around the interior. 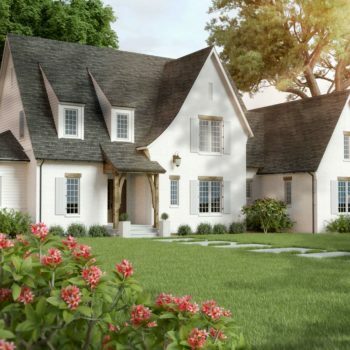 Since most people come in through the front door, I it’s natural to start with the Foyer, Dining Room, and half bath, all of which are at the front of the house. First impressions are very important! Henry and I wanted our home to have a modern feel as soon as you walked into the front door. 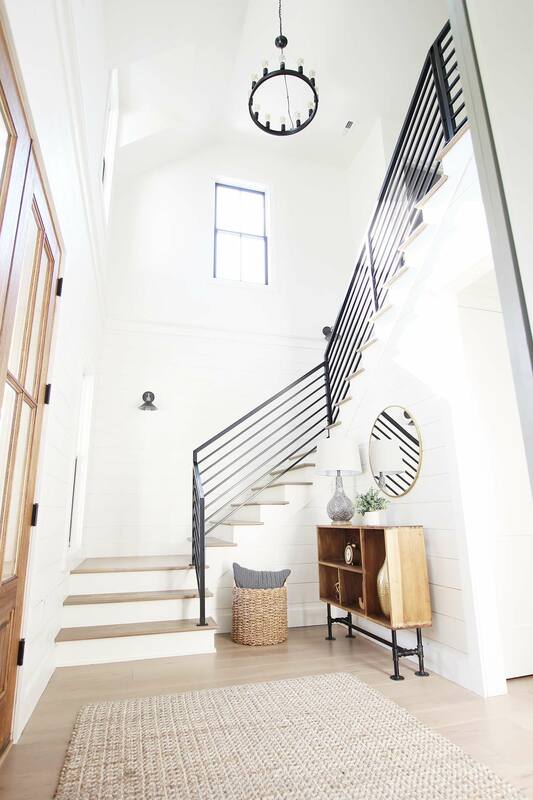 A foyer is a place that should set the style for your home and make someone want to see more. 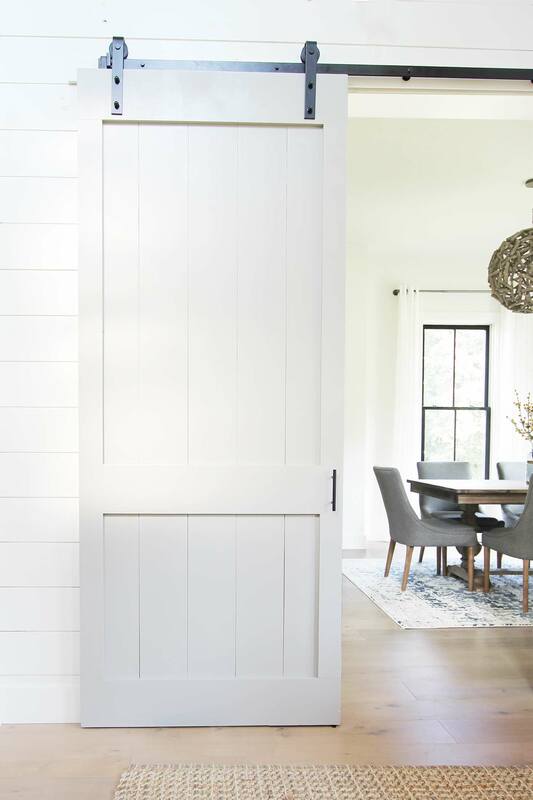 Implementing white shiplap walls, black metal railing, industrial lighting, and a custom made barn door within the foyer was setting the tone for the entire home. They all captured the modern feel we were trying to convey. We went with a simple black industrial metal railing. We love the clean modern lines it creates in this space, and it goes perfectly with the windows and lighting. And the best part is that it was more affordable than traditional wood railing. 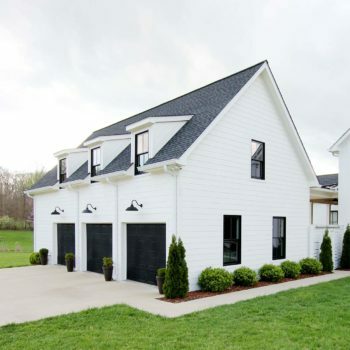 A modern farmhouse wouldn’t be complete without shiplap. 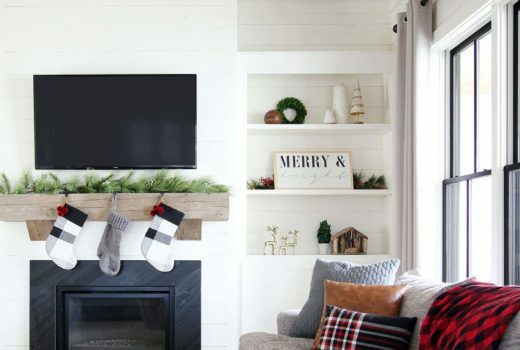 In the planning process, shiplap was a must!Our shiplap is knotty pine, which means there are knot holes and imperfections, which was fine with us. We only went half way up with the shiplap in the foyer and capped it off with some trim. This made Henry’s and my Dad’s life a little bit easier. We let the drywall guys do the hard stuff up high. We painted all walls and trim the same color: Sherwin Williams Creamy. The she drywall has a flat finish and the shiplap and trim is satin. 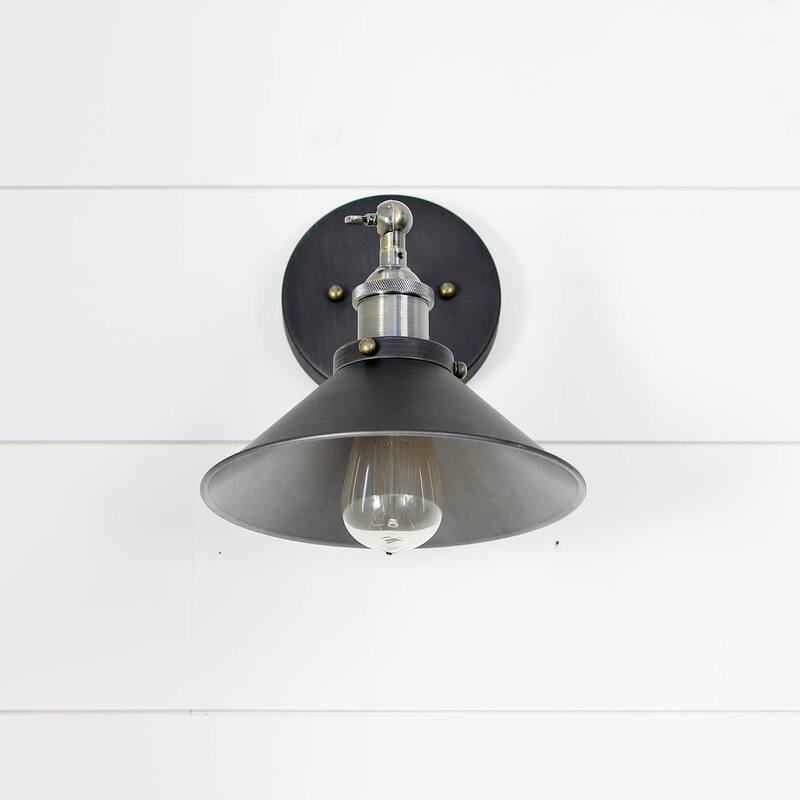 For the lighting in the foyer, we went with an overhead industrial light and a couple of farmhouse wall sconces. The chandelier is a round 12 light Edison Bulb Chandelier from World Market. We love their lighting and they offer some great prices as well. Again, we felt like black was the best choice here in order to really stand out on the white. The wall sconces are from Houzz and have a touch of brass, which adds a nice contrast. These lights are very handy in leaving on at night time and add great mood lighting for the evening and night. Henry made the barn door that leads to the dining room. We thought this was a nice to touch to add some color and also privacy for the dining room if needed. With the front door being stained wood, we chose to go with Sherwin Williams Dorian Grey. The dining room is off to the right of the foyer through the barn door. Again, you will see the theme of black windows, white walls, and a modern light fixture. We recently bought a table from Pier One called the Bradding Table. 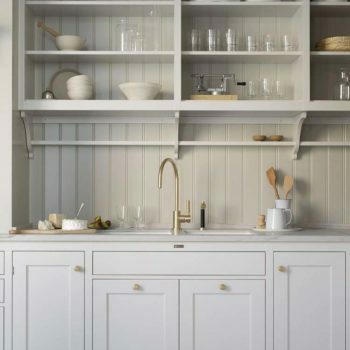 It features a brushed, whitewashed finish with urn-shaped trestle legs. 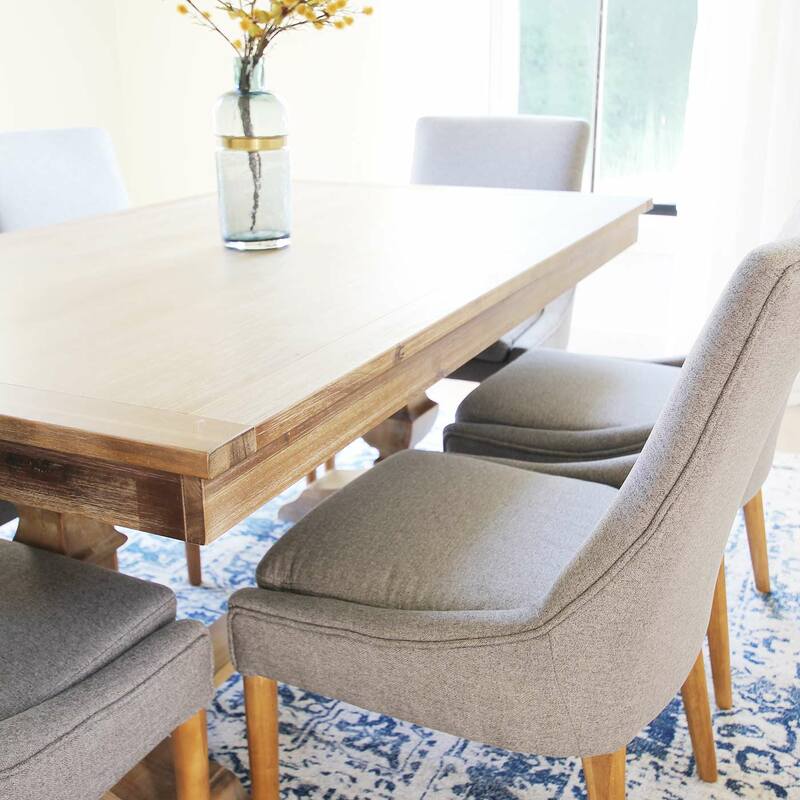 We chose the Darrin Stone Gray Dining Chair with Java Wood legs also from Pier One. We used white sheer linen curtains on all windows to allow for natural light. 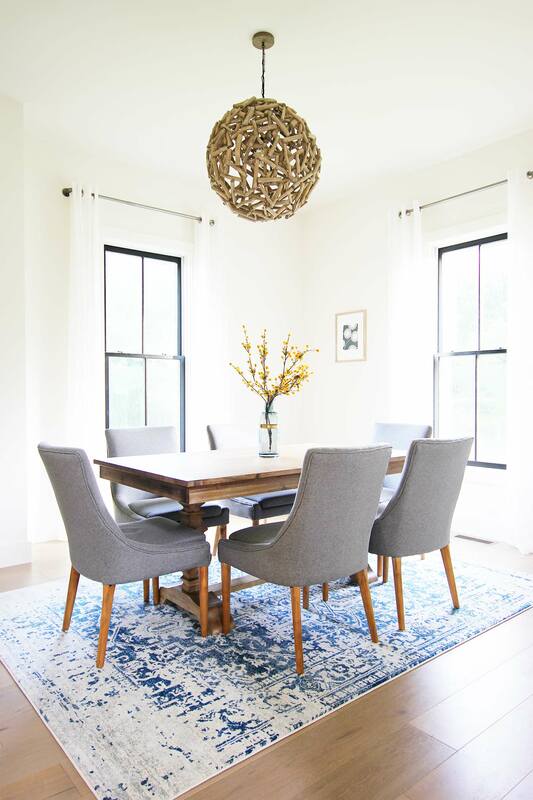 To add some more color, we went with the Hillsby Oriental Blue Area Rug from Joss and Main. 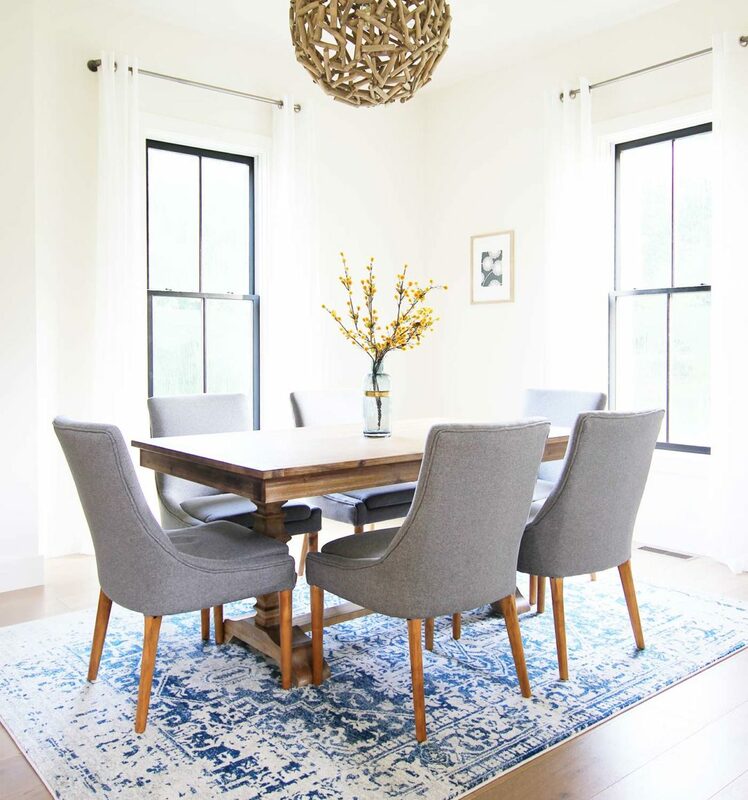 The chandelier here is a the Driftwood Ceiling Pendant from World Market, but sadly it’s no longer available. 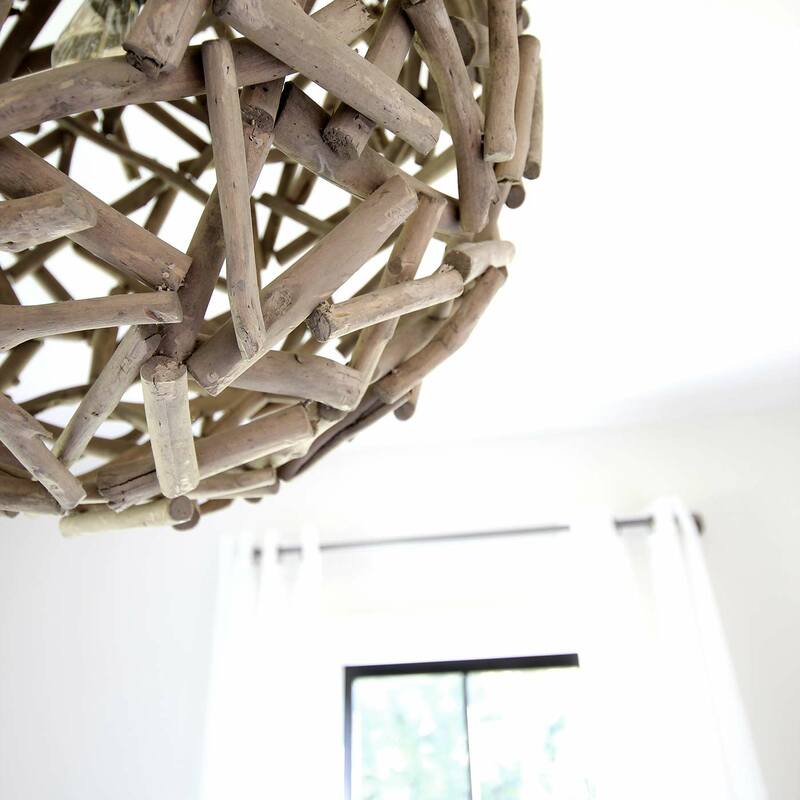 We absolutely love this light. It helps add just the right amount of texture and interest to this room. Our half bath is in the hallway between the dining room and kitchen. We were so happy the plan called for a window in this room. The window allows the room to get lots of natural light and makes it feel bigger than it actually is. Yet, again you will notice the same theme, black window, white walls, and industrial lighting. The lighting here is the Vintage Industrial style Geometric Matte Black Iron Cage Pendant Light from Houzz. 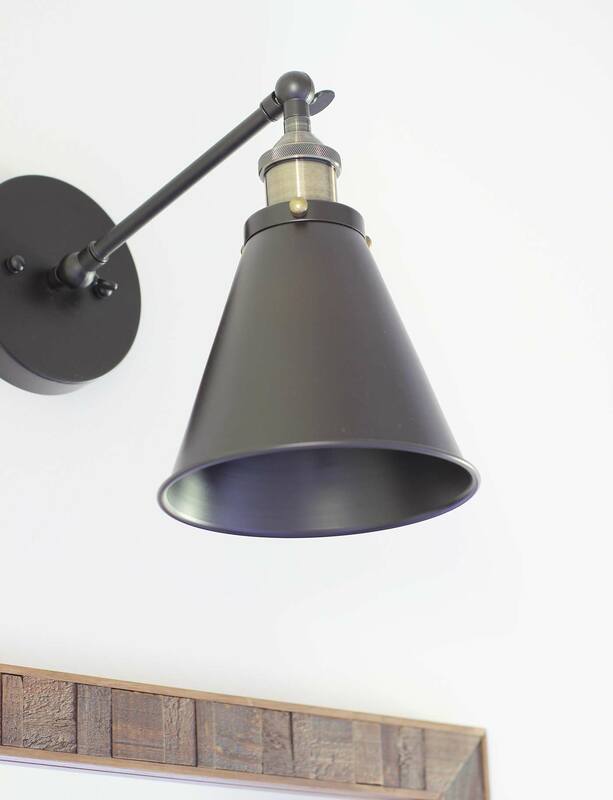 The vanity light is the Industrial Edison Antique Matte Black Wall Sconce from Houzz. For the vanity, we chose a light grey with marble top. I hope you enjoyed this second post in our home tour series. I’m sure we might have forgot to mention a source here or there. So if you have any questions or want more information, please feel free to leave us a comment below. Hey Cheri! Thanks so much for the positive feedback and encouragement. We for sure plan on more every week! Thanks so much Chrystal! So glad you’re here to read our blog and hope you will follow up to see more posts. Hey there Tatiane! We are so excited you like the blog! Keep checking back for new articles and DIYs. So glad you stopped by! Brooke, did you carry your flooring throughout your entire house, including all the bathrooms? The engineered wood is waterproof? Beautiful home! Love the black, white and modern lighting theme! Hey there Amy! Yes, we decided to do hardwood all over. It’s kind of a long story, but in our last build we had a flood due to my son flushing a toy down the toilet. The engineered hardwood didn’t buckle at all with a foot of water standing on it for several hours. This is what our decision to put it in the entire home. It’s easy clean and works out great! Hope this helps! Thanks! Glad you like it. Our flooring is an engineered hardwood called Padua from ADM Flooring. We just got several samples of ADM Flooring after seeing your blog. 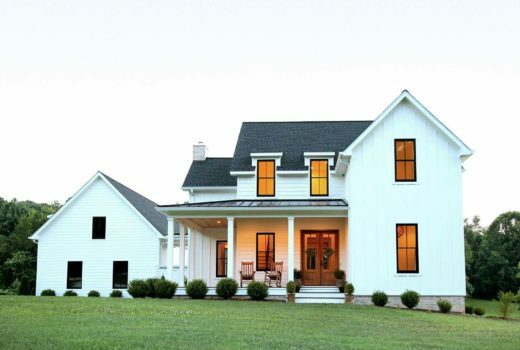 We are also building a modern farmhouse and have been looking for a similar color, style as yours. I did a little scratch test just with the metal part of a plug and with all the samples, we can see scratches. We have 3 kids and 2 dogs and worry about the damage they can do. I wanted to ask how hard you are on your floors and if you’ve noticed any scratching or wear that you’re not pleased with. Thank you. 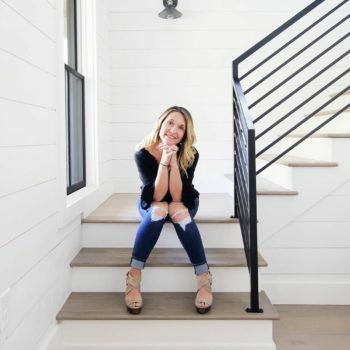 Your home is beautiful and very inspirational! We have a dog and a 12 year old son that rides his hover board and skateboard in the house. 🙂 After seeing your comment, I went and took another look at the area of flooring that gets the most traffic and there is only one scratch, but I believe it happened during the later stages of building where a nail was accidentally drug across the floor. I can honestly say these are the most durable floors we have ever had. I would say that if you did a deliberate scratch test on any flooring, you would be able to see a scratch mark. Hope that helps! Hi Henry, Thanks for your response. I am glad to hear that with the dog and active boy, your floors have held up. 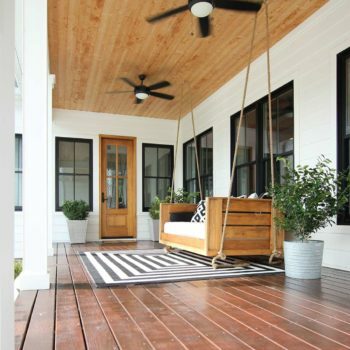 I was starting to lean towards WPC products due to their durability, but am happy to know that there is an affordable and durable wood option that is in our price range. One more quick question, if I might – did your sample match the final product? The sample of Padua that I received looks much darker than the pictures of your floor. The Vicenza sample that I received looks more similar. Just wondering how much variance there might be. I really appreciate your time, and love seeing your projects. You’re very welcome! Yes, our samples did match, but yes there is some color variation between planks. And keep in mind that lighting plays a big role in how things appear. You can even see the difference between the various pictures here on our blog. Hope that helps! Absolutely love the yellow stems in the dining room! Where did you find those? Hello Allie! Thank you so much! We actually purchased it from our local Hobby Lobby. We are so glad you are are following along with us! It’s beautiful. We are considering this flooring for our new home. Can you tell me anything you aren’t as pleased with about the flooring? How’s cleaning? Do you have pets? Also, how did you find a flooring installer? Thanks! Yes, we love our floors and haven’t had any issues with it. We do have one dog, and we have yet to see any scratches on it. It has a very durable finish and easy to clean. It is engineered hardwood called Padua from ADM Flooring. Beautiful home! Where is the rug you have in your foyer and living room room? Hello Fran! We are so glad you like our home. The rug in the foyer is from Target Home. 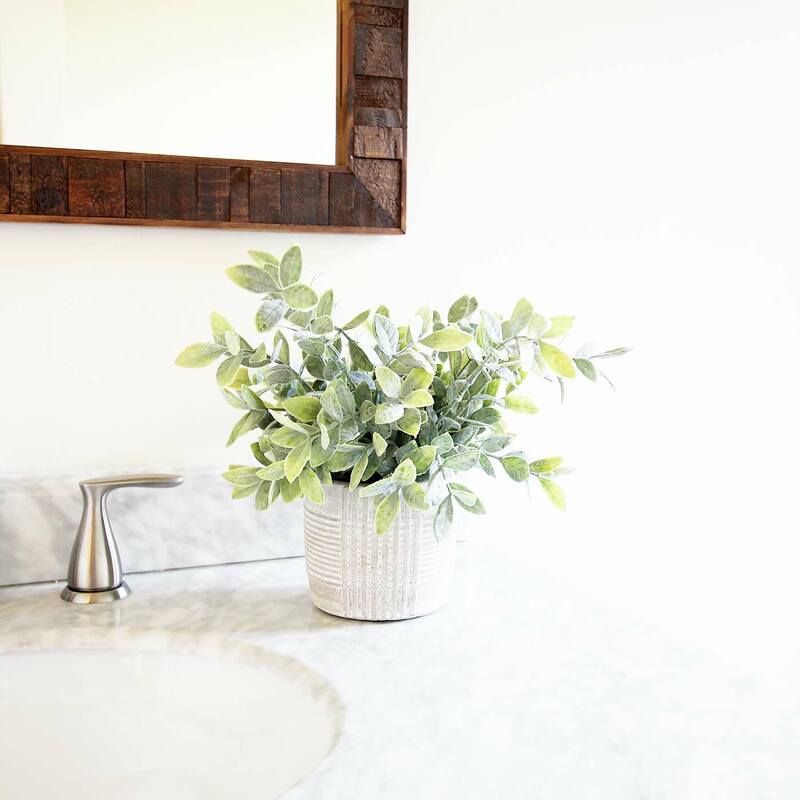 Love your house and blog, especially the diy projects. My husband is building the porch swing and the barn door. 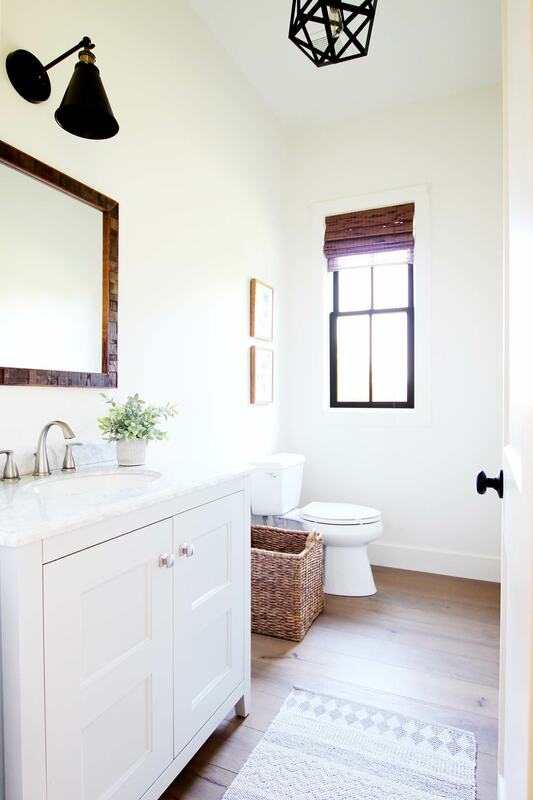 What color black paint did you use on the windows and bathroom barn door? Hello Kelli! Thank you so much for the kind words! I used Sherwin Williams Tricorn Black. Send us some pictures after he finishes so we can post on IG. We are excited to see his finished product! Happy New Year to you too! Thank you. Glad you like it. 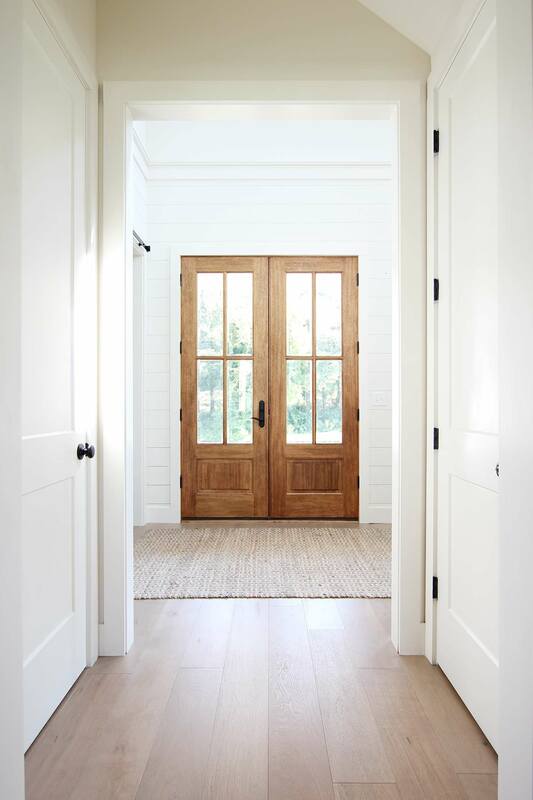 The walls and trim are Sherwin Williams Creamy, with a flat finish on the drywall and satin on trim and shiplap. The cabinets are a slightly different color. I cannot find a Valspar color called creamy, I see creamy oat which looks quite yellow in the pic. Is that the color you used or did you color match the Valspar paint to a different brand color? Thanks! Hi Holly. It’s actually Sherwin Williams Creamy. That was a typo on the article. I’ve corrected it. Beautiful house! Where is the metal railing from? Is it local or can I purchase at a chain store?